Saskia means Saxon woman - Woman of the world (The name is part Russian). Saskia is a recording artist from Doncaster. New single “Say Hello” is her first venture into country music. Saskia Solo Singer of Covers and own material. Has performed in holiday camps, backing singer (Spandau Ballet tribute), sang in a girl band with five other girls touring holiday camps, Country & western singer in Blackpool hotels. Available for solo singing in pubs/ clubs / hotels / UK and abroad. 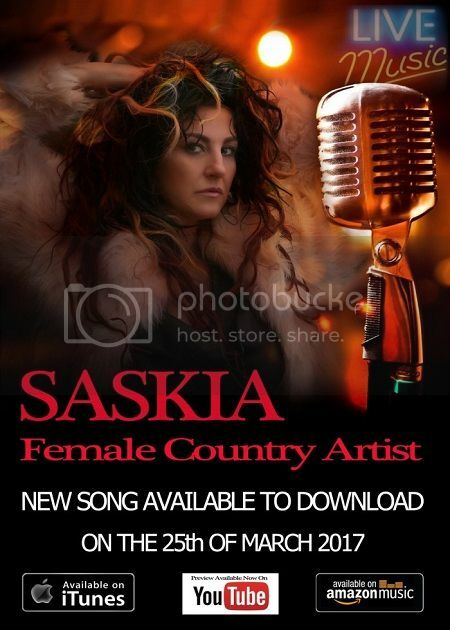 Saskia is a solo artist, she sings, country, pop, country rock, wartime, 60's,70's,80's to present date. Saskia original song released March 25, 2017. The up-tempo song “Say Hello” was written and produced by EBA RECORDS (Unit 20A, Raglan Works, Methley Road, Castleford, West Yorkshire WF10 1NX) who played all the instruments. “Say Hello” is Saskia’s first venture into country music. It’s her first original solo singleand fondly tips a nod to her mother. A comforting and strong willed mother is resigned to the fact to be positive and move on with a free-wheeling spirit. Fast forward some 2 decades, burdens and regrets have healed and the girl, now a mature lady, makes a pledge to her own young daughter, to be there thus giving her the life she didn’t have. Gig Alert: Come “Say Hello”! Saskia will be singing for 1 one hour. She’ll be doing some Shania Twain cover songs along with a selection of songs including her own brand new single “Say Hello”. On the night you will be able to take a signed picture home and a CD with a lot of her Shania Twain cover songs on. One of her most notable projects was a Wonderbra campaign in London which was published in five national newspapers, along with a billboard in London. Saskia has also modelled for Lepel and Charnos as well as Marks & Spencer. Saskia Vese became a fan in 1998 after seeing'That Don't Impress Me Much'. After witnessing a Shania Twain tribute at a local bar she realised she could do a superior job. She hired a singing coach and started a tribute act. As a Shania Twain super-fan, she has invested heavily in the Canadian star’s music, clothes and merch and dedicated hundreds of hours. Regarding her fixation, The Daily Mail (UK) ran an extensive article on her and a feature was published on the hugely popular Entertainment website Taste Of Country! "Some great music now..she's a good singer" - Lee Williams President of the British Country Music Awards and CEO of CMR NASHVILLE "Europe's #1 Country Music Radio Station"